Folks, first a Tornado now a fireball in the sky within the same week. This is definitely not nature. What is brewing in the Oceans or pointing at the Ocean from space is definitely not the works of Our Lord Yeshua Jesus Christ. On February 1, 2019 at 1:15 pm local time, a long trail of smoke believed to be a meteor is being reported. Coincidentally, exploding on midair on the western skies of Cuba. Windows were shattered and meteorite rocks on peoples homes. There were witnesses all the way from the Florida skies. A rare tornado hit Havana injuring 100's on January 27, 2019. Locals said that she has never seen anything like it. It happened in a few seconds. Being Cold in the Northern part of the Hemisphere is nothing unusual. But what is unusual is the extreme record breaking cold weather. Yesterday, January 29, 2019 Winnipeg, Canada which is located in the central part of Canada hit a whopping -53 c windchill. This is extreme weather conditions and abnormal. Two days in a row the record high unimaginable weather has hit the thermostat. Luckily Winnipegers are use to the cold weather and they are equipped it. However in some parts of the United States and Mexico, they are not use to cold climate weather and each year it is looking a four season climate. Lovequist -50 weather Toilets were seemed to be frozen from the inside? In Manchester Airport United Kingdom the flights were grounded yesterday after heavy snow hit the runaways. There were massive Gigantic waves spotted in #SanSebastian, Spain near the Spain French border this afternoon 29th January. On January 29, 2019 in the area of Cerdanya, Catalonia, #Spain they were hit with blizzard conditions and #heavysnow. Meanwhile the opposite was occurring in the Southern Hemisphere where the rubbers of the tires looked more like liquid than anything else. The video shows the military taking care of a 140-meter-long, 11-meter-deep rock jam that blocked the Bureya River in Russia’s Far East after a landslide – in a way they do the best. With the energy of some 20 tons of TNT, the fiery explosion hits the ice-bound river, sending gigantic plumes of smoke into the air and making the ground shake. Near a river the landslide falls on busy road. Are the sinkholes around the world Man made or simply an act of a secret space program ready to take out the world. Are they targeting water reservations, ponds, lakes or rivers. There is a trend in sinkholes appearing in the Middle East country Iran. In the next video the earth cracks are looking a lot similar to the earth cracks from Africa Rift Zone. Although in the earth cracks in Iran, are being blamed for years of drought. One cannot skip the idea of , could they be created by some king of laser weapon from the sky. It already has been announced that there will be to deter missiles from space. Some sinkholes are as deep as 60 meters. No matter what kind of drought the Earth is thousands of years old and if the drought would be the problem then the world would be full of Sinkholes. That is not the case. The fact that this phenomena looks more like a man made mistake or weather manipulation or biological warfare cause by some kind of laser weapon used in space. snow #avalanche in Tlyarata, Dagestan, Russia at noon on the 27th of December! The earthquake struck at 03:19 a.m. local time near the villages of Viagrande, Santa Venerina and Zafferana, at the foot of Mount Etna, Europe's biggest and most active volcano, which has been erupting this week. 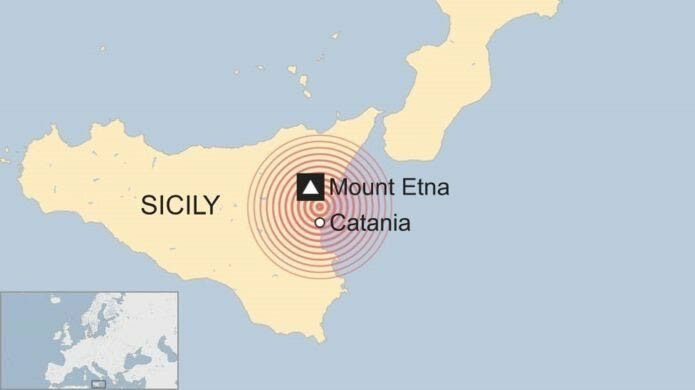 Italy’s Civil Protection officials said the quake was part of a swarm of about 1,000 tremors related to Etna’s volcanic eruption, most of them small and therefore barely perceptible. The earthquakes began on December 24, 2018 a resident filmed while loud explosions came out of volcano. A 7.5 earthquake happened on December 28 1908 Tsunami was created but not from a volcano. December 27, 2018 6.1 magnitude earthquake hit again at 10:03 a.m. local time (0303 GMT) with an epicenter of 26 km under earth of southeast Manokwari.